Ever wonder what the occasional “stay tuned, we’re working on something” messages have been at the bottom of posts? It’s been a few months in the making, but it’s finally here: the third update to FOSSwire. Our focus this time was not new buttons and knobs, but interaction. See that login box on the right? Give it a try: type in your OpenID or click one of the providers below it to sign in in a few clicks. You’ll be able to manage your comments and take advantage of tons of other features described below. Comments are now easier than ever to use: we’re taking advantage of Markdown formatting, meaning you can use emphasis, links and even images to style up your comments. When you see a Quote button next to a comment you want to address, click it to refer to it and include it in your post. If you’re signed in, all you need to do is type in a comment and hit Reply. If not, just input your name and E-mail address and do the same. Comments aren’t an end-all solution. Sometimes you just want to start a discussion about something unrelated or get support for a problem. Say hello to FOSSwire Talk. Talk is a unique yet simple discussion platform that works as a hybrid of comments and a forum. Discussions can be tagged and categorized. If you’ve got something on your mind, want to discuss code, or just want to have a good old vim vs. emacs war, pop open Talk and fire away. Talk works much like comments: you can use Markdown formatting to write your posts and replies, and can quote others’ posts. However, while Talk is accessible to the general public, you must be signed-in to post. We’re looking to expand on Talk in the future. If you have anything in particular you’d like to see, post it in the Feedback section. Here’s something everyone can enjoy: submissions. We’ve received a number of requests over the years from people wanting to write articles for FOSSwire. Now you can, and it’s easier than ever to do so. You can submit a full-blown article to the submissions queue where it can be voted on by other members. We’ll periodically take the best-rated submissions and put them on the front page for all to see. Editors will even help you out with your content using the post whiteboard, a private workspace to dump your thoughts or communicate with an editor. We’ll help you make sure your article is the best it can be. Submitted articles can be of any type: news, editorials, tutorials, rants, raves, and whatever else works out for you. If you want to be that person to review an Ubuntu release, there’s nothing stopping you. What’s more: you get full credit for your submission. Under published posts is a generously-sized box with your avatar/picture that links back to your profile and website. Perhaps we’re a bit late on the Web 2.0 bandwagon, but we’re offering even more ways to communicate and interact with FOSSwire. First, as mentioned earlier, is OpenID support. You can sign in with one click and begin posting. If you want to have more than one OpenID linked to your account, go right ahead. As stated in the section above, you can have a profile box displayed below your articles. To use it, just open the profile editor: click My Profile and then Edit to fill out all of the information that you want. We’ll be adding more fields in the future so you can add all of the social networks that you want. 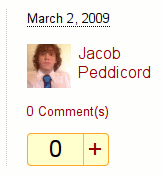 Speaking of social networks, take a look at the right sidebar. You may already know, but FOSSwire is available on Facebook, Identi.ca, and Twitter. Follow us to stick with the latest updates. So how does this all work? You may have known that we were using WordPress on the old site, but now we’re fully up-and-running on custom software using the Django web framework. All of the posts, content, and comments have been imported from WordPress into this platform. Having a custom-built site means that we’re not restricted to traditional publishing methods; if there’s something that we think should work differently then it’s just a few lines of code away. In the end it makes the site a lot more manageable and ultimately enjoyable for everyone.